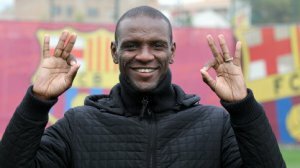 Spanish authorities have re-opened a probe into ex-Barcelona player Eric Abidal‘s 2012 liver transplant after confirming that new evidence suggested a trafficked organ was used, according to a legal decision seen on Wednesday. The courts have previously looked into Abidal’s transplant because of doubts about the identity of the donor. Seven years ago Abidal, playing at the time for Barcelona and France, had received a transplant as he battled liver cancer. In the decision, seen on Wednesday, a Barcelona judge found ‘it had been proved that there was new evidence against those investigated, so that the case can be reopened’. The Spanish prosecutor initially reopened investigations after Spanish media published tapes of the former Barça president, Sandro Rosell, suggesting that the club had illegally bought a liver for their defender. Abidal, who is now Barcelona’s sporting director, says his cousin Gerard Armand, who lives in France, was the donor. The latter said he had not received anything, ‘not a centime’, in exchange. The prosecutor asked that Armand undergo tests to prove that he had donated part of his liver. In October, the same judge drew criticism after ruling there was a ‘lack of evidence, just conjecture and suspicions’ and declaring that it was impossible to force Armand to submit to a medical examination because under French law he could donate his organ. Prosecutors persisted and in reviewing the decision, the Barcelona magistrate noted possible anomalies in the donation procedure, pointing to the absence of a donor’s identity document in the medical file and ‘alleged irregularities’ in the consent signed by the parties. That, in the judge’s opinion, constitutes ‘sufficient evidence of the alleged commission of the offence at the heart of the investigation’ and justifies the continuation of investigations, such as the summoning of Armand as a witness. Barceloba, Abidal, Rosell and the Spanish organ donation organisation have always denied any wrongdoing.